My dog’s stomach started making gurgling noises about an hour ago. At first I thought Skippy was growling, which would be unusual for him. But when I listened closer, I realized the sound was coming from his tummy. He doesn’t seem to be in any pain, and I can’t see any other symptoms. Is something wrong with my fur baby? Why is his tummy so grumbly? Should I take him to the vet or wait it out? Is there something I can do to make the stomach gurgling stop? Please help! A dog’s gurgling stomach can be an alarming sound for concerned pet parents. It’s a sign that something is going on in your dog’s digestive system, but it’s hard to know what exactly that might be. Your dog can’t just tell you what’s wrong or if they’re in pain, so it’s up to you to know what to look for and when to be concerned. The good news is that most of the time, a grumbly tummy isn’t much to worry about, especially if you don’t see any other outward symptoms along with it. However, there are times where a loud stomach can be a sign of serious problems. 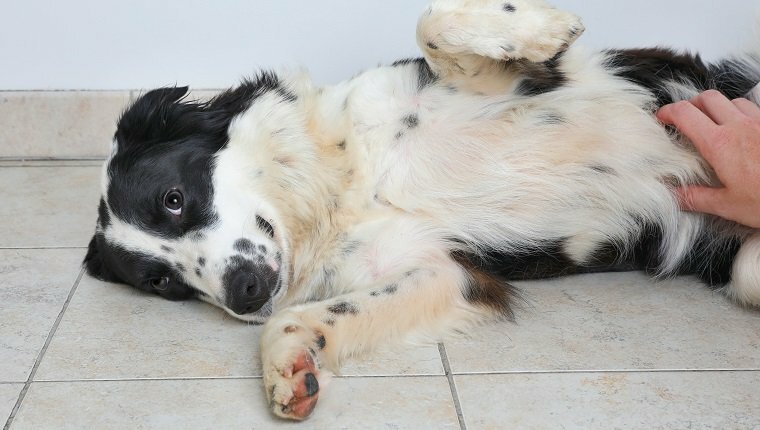 Here are a few things you should know about your dog’s gurgling stomach, what it might mean, and what you should do about it. First of all, you may be surprised to know that there is an actual word for a growling stomach. It’s called borborygmi, and it happens when gasses or fluids move through the digestive tract. Borborygmi is fairly normal in dogs. That’s one of the reasons it’s so hard to determine if something is wrong just from stomach gurgling, alone. The important thing to remember is that you shouldn’t panic. Watch for other symptoms, and if you are concerned, consult your veterinarian. When Is Your Dog’s Gurgling Stomach Harmless? Most often, a gurgling stomach is a minor symptom that is no cause for alarm. It could mean your dog is hungry, that they ate something that disagrees with them, or that they are feeling gassy. Maybe your dog snatched some table scraps or something off the ground that upset their digestive system. Even changing your pup’s diet can cause stomach gurgling. Keep an eye on your dog. If they aren’t showing any other signs of illness like lethargy, loss of appetite, vomiting, severe diarrhea, or signs of pain such as whimpering or lying down in unusual positions, then the gurgling stomach probably isn’t a serious problem. Even a minor case of diarrhea is usually not too concerning. However, if the gurgling persists for more than 24 hours, it’s best to check in with your veterinarian. 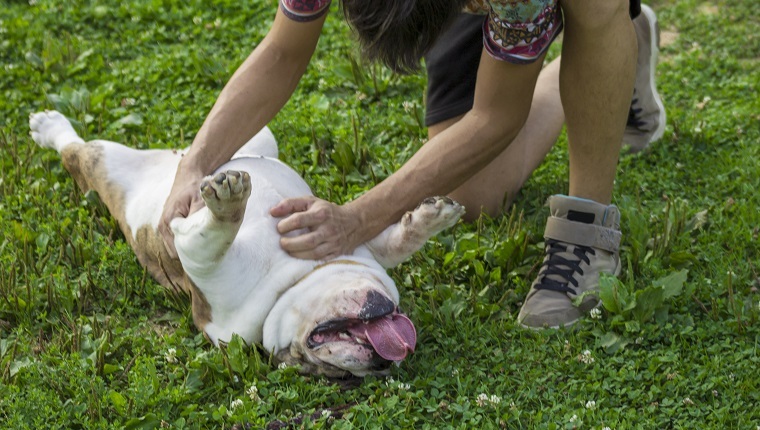 In the meantime, there are a few ways you might be able to relieve your dog’s upset tummy and help the gurgling stop. The key factor in minor cases of digestive upset is time. With enough time, most dogs’ digestive systems right themselves, so the best thing you can do is avoid doing anything that might make the situation worse and delay that process. Here are a few things you can try to stop minor stomach gurgling. Withhold food for up to 24 hours. This will give your dog’s body time to remove whatever is causing the issue. Make sure your pooch has plenty of opportunities to go potty outside, and you may want to bring some extra poop bags on your walk, just in case. If you suspect the gurgling is because your dog is hungry, try giving them a bland serving of poultry or fish and white rice with no added spices, seasoning, oils, or other ingredients. Some dog owners also use banana baby food. Many dog owners give a spoonful of pureed pumpkin to fix their dogs’ tummy troubles. Pumpkin gives your pup a serving of fiber that helps with digestion. There are several antacids that can help treat minor digestion problems in dogs. You should ask your veterinarian about using them. Pepcid, Imodium, and Corrective Suspension are some of the medications that vets may recommend. If your dog’s stomach gurgles often, they may be swallowing air when they eat too quickly. Consider feeding them food in individual bites at a time, serving them in a raised bowl, or purchasing a bowl designed to slow down speedy eaters. You might also want to try feeding them in smaller, more frequent servings rather than large meals. If you see other symptoms along with a gurgling stomach, or if the noises last more than 24 hours, you should contact your veterinarian right away. It may still be nothing to worry about, or your dog may be suffering from a serious health issue. That’s why it’s not worth taking a chance. 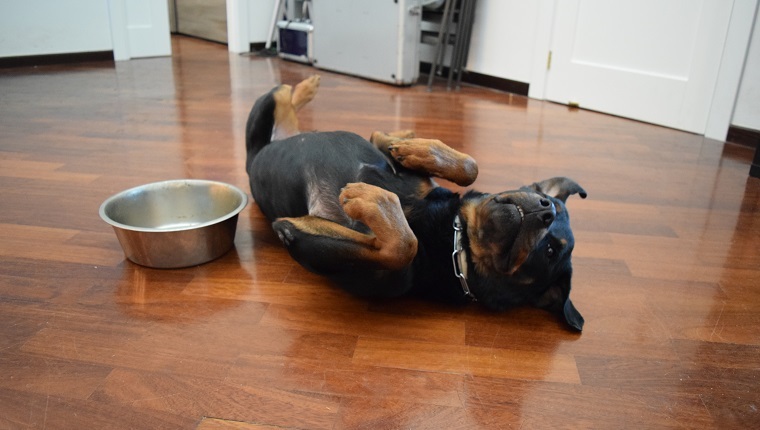 If your dog’s stomach noises are accompanied by any of the following signs, get to the vet. There are so many possible causes for your dog’s symptoms that you must get a proper diagnosis from your vet to begin treatment. Withhold food and water until your vet instructs you. Do not give your dog antacids, as they may make certain serious conditions worse. 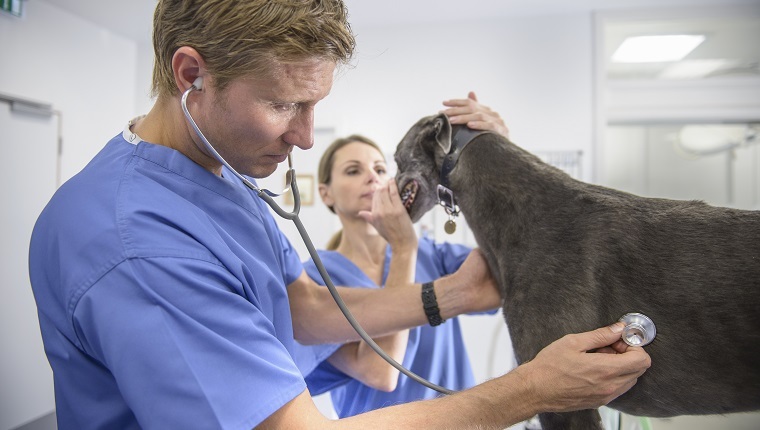 If symptoms are severe, you may need to go to an emergency veterinarian, but do not delay. Some causes of stomach gurgling along with additional symptoms can be life-threatening. Here are just a few of the possible causes. Gastrointestinal obstruction. If your dog ate something that blocks or perforates their digestive tract, they may require surgery to fix the problem. Bloat. This is a condition where the stomach twists in on itself, and it is fatal if it goes untreated. If your dog looks like they will throw up, but nothing comes out, it could be bloat. Larger breeds are at higher risk. Exposure to toxic substances. Poisoning can cause an upset stomach, dehydration, seizures, unusual behavior, and more. Some common sources of poisoning in dogs include medication, antifreeze, household cleaners, pesticides, or other chemicals. Irritable Bowel Syndrome, food allergies, or other chronic conditions. While they are not necessarily fatal, they will not be managed without treatment and dietary changes. Infection. Parasites, bacteria, and viruses can cause diseases and infections in the body that affect digestion. Treatment will depend on the diagnosis. Tumors. Certain forms of cancer can cause gastrointestinal blockages and damage. So, R.U.M.B.L.E.S., all of that information may worry you, but just keep in mind that your dog’s gurgling stomach is most likely nothing to worry about. You’ll probably be able to treat it at home, and your dog’s tummy will be as good as new in about a day or less. Obviously, you should supervise your dog and look out for any other signs that something more serious is going on. Have your vet’s number saved in your phone, just in case. Has your dog ever had a gurgling stomach? What did you do to treat it? Let us know in the comments below!